Like everyone on Monday, I watched in horror as the tragic events in Boston unfolded on my computer screen and tv. I will never fully comprehend why there are sick people in the world who desire to inflict death and injury on innocent people that they do not even know. My heart is hurting right now as I think about the pain the parents of the 8 year old child who was killed are going through. My youngest is 9. I cannot imagine life without her. What struck me from the images were the people that were rushing immediately into the chaos to help those who were injured. They didn’t know if another bomb was going to go off (one did 10 seconds later). They didn’t know the people that they were going in to help. I am positive that they did not want to see what they eventually saw when they got there. There was a picture of one man in a cowboy hat walking along side a man in a wheel chair as he put pressure on his severed artery. 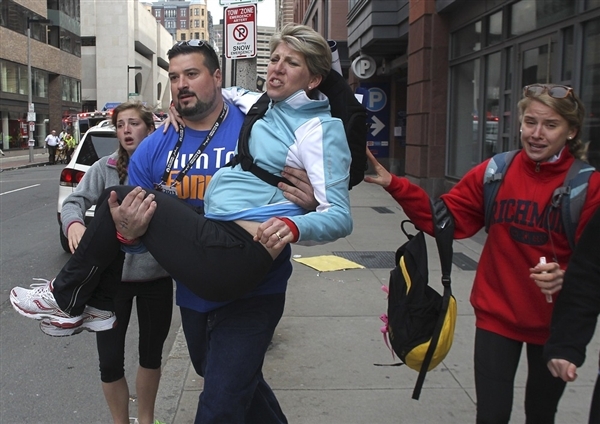 A former Pro Football player carried an injured woman to an ambulance. It reminded me that community is not an option. We may never have the opportunity to rush into a tragedy, and I pray that we never have to, but there are hurting people on every side of us right now. In my community group alone, there have been 3 major family crises in the last month. We as the Church are called to be a hospital to a hurting world. Let’s not run away from the pain, but lean into it with the peace that passes all understanding. Posted on April 17, 2013, in Uncategorized. Bookmark the permalink. 2 Comments. Well stated, Chris. I believe that this sort of community, in the midst of tragedy, warms God’s heart. It also is our most effective witness of Jesus to unbelievers. Praying with you for all effected in the Boston Marathon.